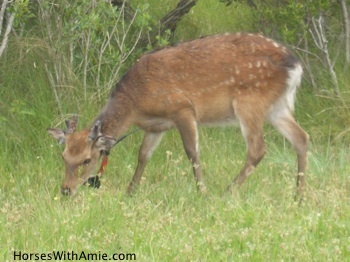 The Sika is smaller than the white tailed deer, but show elk-like behaviors. They are often called "Asian Elk" and during mating season, visitors get a chance to witness exciting physical challenges between males. 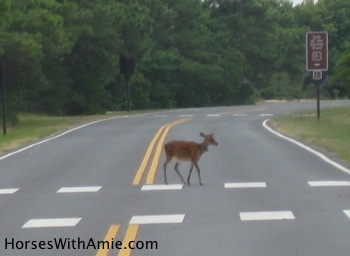 Sika eat the leaves of Myrtle, bushes, grasses, persimmons, shrubs and other plants on Assateague Island. They will also eat Poison Ivy. 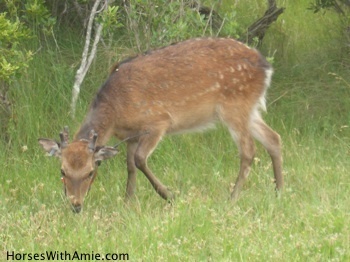 Sika are very vocal animals and at least ten different sounds have been recorded. There are many subspecies and their fur color can range from chestnut-brown with reddish fur on top of there head to a dark brown or black. They have white spots on there back which are visible during different seasons. Scientists are still trying to figure out how many subspecies there are but currently recognize 6 - 14 kinds of Sika. In certain areas of Asia about 6 subspecies are nearly extinct. 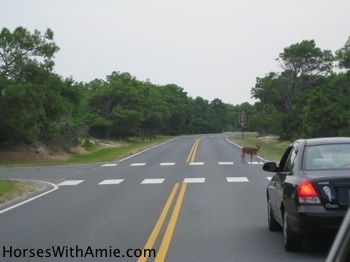 Sika deer have been transported to other centuries and have been known to breed with Red Deer Producing hybrids larger than Sika.They have been introduced to New Zealand, Europe, Australia, and several US states such as Maryland, Virginia, Texas, Oklahoma and Wisconsin.